The policy of extreme austerity has failed not only in Athens, but in the whole of Europe, Greek Prime Minister Alexis Tsipras has said. His comments come as the standoff with key creditor Germany mounts. "The key for an honorable compromise (with the EU/IMF creditors) is to recognize that the previous policy of extreme austerity has failed, not only in Greece, but in the whole of Europe,"Tsipras saidin an interview to daily Ethnos, Reuters reports. The prime minister is convinced he’ll reach an agreement with international creditors to keep the country’s finances afloat. Tsipras’ pre-election promise to drop austerity helped him win support from Greeks, but the prime minister’s anti-austerity tone has slightly faded since then. 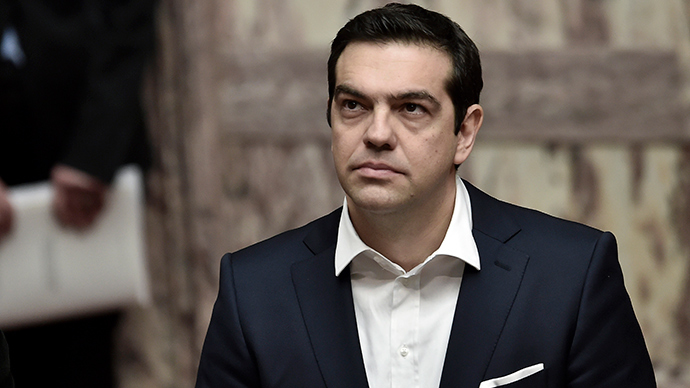 His reform plan worked out in late February to get a bailout extension caused protests against the Tsipras cabinet. People were angry as they felt the new government had failed to fulfill its anti-austerity election pledge. On Monday, the prime minister reaffirmed his government would not return to austerity whatever it takes. "Whatever obstacles we may encounter in our negotiating effort, we will not return to the policies of austerity,” Tsipras was cited as saying by Reuters. He also expressed hopes that the issue would be resolved at the EU summit, scheduled for March 19 and 20. "I don't believe we will need to apply alternative plans because the issue will be solved at a political level by the end of the week in the run up to the EU summit, or, if necessary, at the EU summit (itself)," he said. Greece’s bailout program extension was approved by the so-called troika of lenders in February; nevertheless, Greece hasn’t received the aid from the ECB. Athens must agree on a revised package of reforms in order to obtain the remaining aid from the eurozone and IMF. The prime minister also blames eurozone austerity for the country’s unprecedented recession. Since 2010, when Greece undertook the austerity measures, the economy has lost a quarter of its value, a third of Greeks live below the poverty line and the unemployment rate has reached 30 percent. The standoff between Greece and the eurozone is ongoing. Last week, German Finance Minister Wolfgang Schauble said he was losing patience with Greece and warned of a ‘Grexident’ or a possible accidental exit of Greece from the eurozone. The European Central Bank has also cut Greece off from short-term lending allowing Greece to run out of cash and making it agree to the package of reforms under the terms of the extended bailout. Meanwhile, anti-Greece sentiment is gaining momentum in Germany. A poll published last week by public broadcaster ZDF showed that 52 percent of Germans no longer want Greece to remain in Europe’s common currency, which is up from 41 percent last month. German people claim that Greece’s government “isn’t behaving seriously toward its European partners,” according to Bloomberg. Germany is the biggest contributor to Greece’s €240 billiontwin bailouts, and last month saw a wave of protests on the streets and in the media calling on Greece its find its own way out of the crisis.